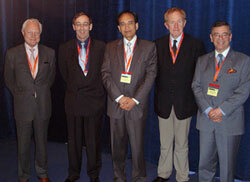 The First Congress of the International Academy of Oral Oncology (IAOO) has now taken place. To ensure you receive information on IAOO 2009 in Toronto and related congresses please complete the information request form. 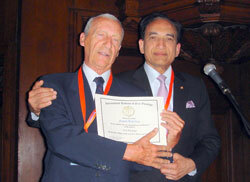 More than 750 head and neck surgeons, maxillofacial surgeons, otolaryngologists, oncologists and others in the head and neck cancer team congregated from around the world at this First Congress of the IAOO, coordinated by the President, Professor Jatin Shah (New York), and the Program Chairs, Alexander Rapidis (Athens and Eastman) and Crispian Scully (Eastman). The Congress was an enormous success, being completely sold out months before the event. View more pictures from the Congress here. The Congress covered a multitude of topics representing subspecialist interests in the major sub-divisions of the field. The scientific program included keynote addresses, panel discussions, debates, instructional courses, oral papers and posters. The program was supported by a commercial exhibition, delegate receptions and a Gala Dinner.